After picking two small parcels of fresh-gathered violets, put them, with a pinch of cochineal seed, in twelve ounces of clarified sugar, nearly boiling; then cover the infusion perfectly close, and when the sugar is lukewarm pass it through a silk sieve; after which you add to it half a glass of good kirschwasser, and one ounce of clarified isinglass, nearly cold; stir the whole with a silver spoon, and then pour it in a mould, into which you have previously put ten pounds of pounded ice, taking care that the ice reaches nearly to the rim, and is everywhere of the same thickness. Cover the mould with a stewpan-lid, on which put a little ice, and then let it stand three hours. When you are ready to serve, dip the moulds quickly into a large stewpan half filled with hot water, and then turn the jelly immediately out into the dish. N. B. No jellies of flowers or red fruit should be put into tin vessels, nor be touched with pewter or tinned spoons. This jelly may also be made by pounding the flowers in a mortar, and then putting them in lukewarm sirup. Let them stand for five or six hours; after which strain them through a fine napkin, and then add the kirschwasser and the isinglass to it. N. B. To obtain an ounce of clarified isinglass, you must take one ounce and two drams. 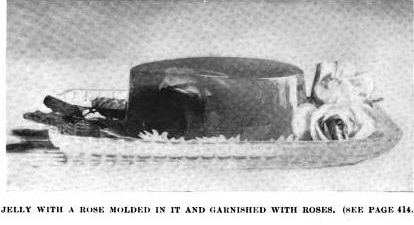 Put the leaves of about thirty fine roses and a pinch of cochineal seed into twelve ounces of clarified sugar; cover the whole quite close, and as soon as it is lukewarm strain it through a sieve; then add half a glass of distilled rose-water, half a glass of kirschwasser, and one ounce of clarified isinglass. Finish as before directed. N. B. Jellies of jessamine and other flowers are prepared in the same manner. Four ounces of flowers are sufficient for a jelly. Take two ounces of fresh gathered orange-flowers, and proceed as before, adding to the sirup, after it is strained, one ounce of clarified isinglass, with the juice of three oranges or lemons. After they are preserved, as has been directed, you must clarify a little more sugar, with orange flower water, and make a jelly of codlings, which, when ready, put in the flowers, syrup, and all; give them a boil, scum them, and put them into your glasses or pots. To suspend a bunch of grapes in the center of a form, first pour into the mold a layer of jelly one half or flowers, inch deep; let it harden; then place on it, and arrange in good shape the bunch of grapes, leaving one half inch or more space around the sides; pour in another half inch of jelly, but not enough to float the grapes; when that has set, cut with scissors the grape stem in many places, so it will fall apart when served; then fill the mold with jelly. Any fruits, or flowers, can be put in in the same way, care being used to add at first only just enough jelly to fix the ornament; otherwise it will float out of place. Plain jellies are more transparent when molded in forms having a cylindrical tube in the center, like cake-tins. The space left can be filled with whipped cream or with fruits, which gives a pretty effect.